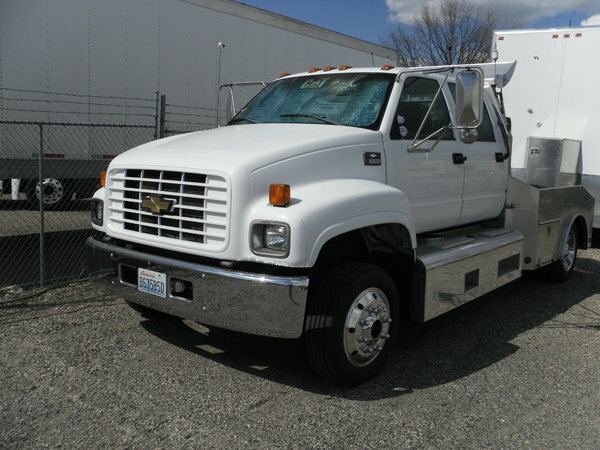 1998/99 Chevrolet C-5500 Lo Pro/Monroe Crew Cab and Chassis, very low mileage. Custom medium dark grey cloth interior, full carpet to match, Flexsteel captain chair front seats, standard Chevrolet bench seat in rear. Leather wrapped tilt steering wheel. Power windows, door locks and Electronic speed control. Tinted glass all around. Full Cover Craft Console with 12V RV television. Pioneer stereo system. Viper Alarm System. Uniden CB Radio with remote speaker. Fresh paint on cab August 2018. Alum-Line Pro. Hauler bed with aluminum tube steel headache rack, custom polished aluminum air deflector, 2 - 20” long locking tool boxes, heavy duty 6,000 lb stainless steel tie downs, fabricated goose neck trough and cover door, heavy duty goose neck frame mount with 3” ball. Bed Mounted Honda EB5000X Generator in tread bright box. Fully plumbed for tag or goose neck trailer air ride system, with new Vair 380C, 200PSI Compressor. Air Hitch Technology Air Safe Class 9, (twin 8’s) commercial tag air hitch. 4,000 lb tongue weight, 40,000 trailer weight.